Slit pair quadrax contact technology is used in the Rugged D-sub connector series, released by Smiths Interconnect. 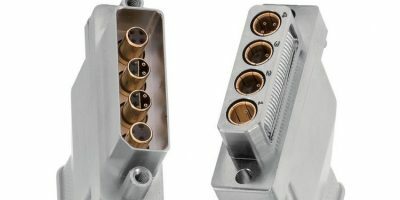 The split pair quadrax is the next generation contact that provides robust high-speed performance compatible with existing qualified Rugged D-sub connectors, explains Smiths Interconnect. Existing twinax contacts support data rates of above 10Gbits per second, but this is typically achieved at the cost of signal density in the architecture, says Smiths Interconnect. The split pair quadrax design isolates the individual pairs within the quadrax format in existing, space qualified, interconnect systems. The resulting isolated pair contact fits within existing housings and supports high density data rates, exceeding 10Gbits per second. The Rugged D-Sub connectors with split pair quadrax contacts support all mechanical and environmental performance parameters with enhanced electrical signal integrity. The extended range meets the high-speed application requirements of the space and mil/aero markets, for example the ability to reliably transmit and receive 10Gbits per second and beyond with a stable characteristic impedance of 100 Ohms and compliance to all MIL-STD-202 requirements for shock and vibration. Smiths Interconnect provides technically differentiated electronic components, subsystems, microwave and radio frequency products that connect, protect and control critical applications in the commercial aviation, defence, space, medical, rail, semiconductor test, wireless telecommunications, and industrial markets. Smiths Interconnect is part of Smiths Group, delivering products and services for the medical, security and defence, general industrial, energy and space and commercial aerospace markets worldwide. Smiths Group employs approximately 22,000 people in over 50 countries.